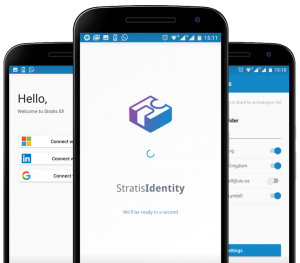 Today we are proud to release the first Stratis Platform Proof of Concept — The Stratis Identity App. In a joined effort between Stratis and the Escalate Group, we have assembled the first building blocks of many possible applications on the Stratis blockchain. Built on top of the Stratis Platform infrastructure this proof of concept showcases personal and corporate identity management capabilities on the Stratis blockchain to deliver a real use case for users to attest their identity on an immutable ledger and share that data with others via social networks. With the Stratis Identity app, you can validate an identity, or other documents, once. After that, you just share the attestation, not the document itself. This feature can help shorten business processes and avoid exposing customer data. Proof of the information you confirmed with a social login provider, like Microsoft, will be written to The Stratis Blockchain. No actual personal information will be exposed without your explicit permission. 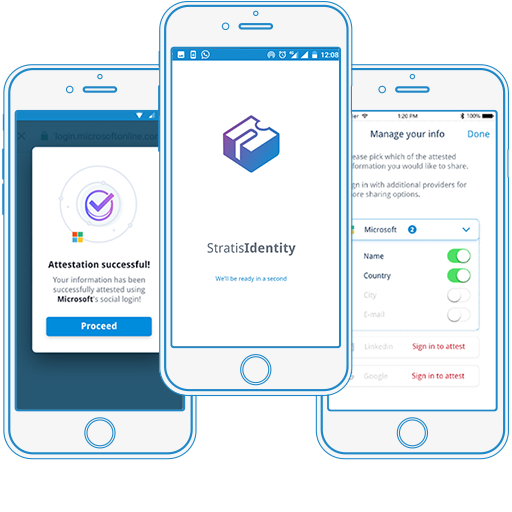 On this initial beta-release, the Stratis Identity app tightly integrates into Microsoft’s Identity and Cloud Management solutions (Azure B2C Active Directory) and the Xamarin framework to provide an additional blockchain layer of trust to identity certification. For the first time, a blockchain project showcases this deeply integration with key enterprise tools such as Microsoft’s Azure Active Directory B2C which provides unparalleled customer identity and access management in the cloud. The development with the Xamarin platform, provides a great opportunity to demonstrate versatility for multi-platform deployment when developing blockchain apps in the Microsoft environment. Additionally we have combined Graph API, Application Insights, Microsoft Teams and Visual Studio Team Services to dramatically improve the development and deployment cycle towards a fully functional application. In summary the Stratis Identity App will be a great first experience for developers to learn about integrating existing enterprise tools with the different Stratis modules that could help them bring enhanced trust to social interactions with the help of blockchain technology. For developers, we are providing documentation and access to our Github page (eventually the project will be fully open-sourced). A key element of our strategy is the development and release of proof-of-concept apps that can be customized into full blown products and used as building blocks for developers in the C#/Net environment. The idea is to show and tell how simple it is to build blockchain apps using the Stratis Platform, while providing basic elements to get projects started fast. One key element in this vision, is to also establish alliances with technology oriented business entities in different verticals, that can provide their market expertise and help refine our solutions for different business activities, co-develop licensable technologies and provide customer support. On this line of thought, we think the Stratis Identity PoC could become a key element in developing opportunities through Microsoft channels, partners and customers that are currently exploring the different blockchain options available in the market. Also, this will become an invaluable tool to show and tell to potential clients how actual decentralized blockchain apps work and how they can improve existing business processes. We expect to continue delivering several proof of concept apps, like the one announced above in partnership with Earth Twine and other organizations that are finalizing the onboarding process. You can contribute to the Stratis identity project on GitHub and also you are more than welcome to propose new ideas or concepts you would like to test. We look forward to help you solve any issues and provide you with tips to get you started developing your own blockchain based apps on the Stratis Blockchain. Stratis is powerful and flexible Blockchain Development Platform designed for the needs of real world financial services and businesses.